There are a lot of options of popular and beautiful gemstones representing the month that Christ was born. Blue zircon replaced lapis as December’s official birthstone during a 1952 revision of monthly birthstones by the American National Association of Jewelers. In 2002, they also added tanzanite as another alternate to blue zircon, with turquoise being the original. All three of these gemstones are not only exceedingly beautiful independently, but when brought together make an incredibly beautiful and unique forever keepsake. There are endless options of custom design and style unique to every December baby when these three gemstones accompany and compliment each other’s colors and histories. Zircons are found in granites, or alluvial (river) deposits, and are found in a variety of blue, yellow, brown, orange, green, red and colorless gemstones. Colorless zircon has been used to imitate diamonds for years before the wide spread use of cubic zirconia. This is because colorless zircon is the closest natural gem comparable to a diamond because its fire and brilliance often flashes the colors of the rainbow. On the Mohs scale, zircon has a hardness of 7.5. Zircon is majorly mined in Norway, Sweden, Ural Mountains, India, Sri Lanka, Australia, Vietnam and Nigeria. The best gem quality stones come from Thailand, Cambodia and South-East Asia. Turquoise is one of the oldest known gemstones known to man and is readily available in a wide range of sizes. Turquoise appears translucent to opaque and its color ranges from a greenish blue, to robin’s egg-blue and sky-blue shades. Turquoise is most often fashioned as beads, cabochons, carvings and inlays. Its popularity is overwhelming in the American southwest even though its fissionability often fluctuates in the rest of the country. It has a hardness between 5 and 6 on the Mohs scale, and is found in Australia, Chile, China, Iran, Mexico and parts of the United States. Tanzanite was introduced to the modern jewelry industry in the late sixties, and is a variety of the mineral zoisite. To this day, tanzanite is found exclusively in Tanzania, a country in eastern Africa. It has often been used as an alternative for sapphire before its unique color and brilliance became truly esteemed and appreciated. Tanzanite’s prices and popularity has recently surged in the jewelry world because of its dark tone, vivid saturation and beautifully striking violet-blue color. It has a hardness between 6.5 and 7 on the Mohs scale. Tanzanite typically exhibits strong pleochroism, which means that it displays different colors or depths of color at different angles. In the jewelry trade, pure blue tanzanite is valued above all other tanzanite, but some customers actually prefer the lighter and purplish colors. Whether you were born in the month of December or not, these three gemstones are a great addition to your jewelry or gem collection, set well within both gold and silver, and they will bring you praise or compliment your wardrobe year round. They should all be cleaned with warm soapy water. Please take precautions to ensure that these gems are well taken care of in case of tragedy. Having them insured and checking with a trusted jeweler that they are tightly secured in the setting and that the prongs aren’t too worn, easily does this. Life is too short, please enjoy and appreciate yourself, your jewelry and those you love. Disclosure: This column is not intended to give medical or psychiatric advise. If you are experiencing any difficulties, please call your physician, or call 911, or go to your nearest emergency room. This column is for information and entertainment only. Water therapy, which is also known as hydrotherapy, probably has been around since we have. The Romans, Turks, Japanese, and other cultures found the benefits of water many centuries ago. However, in the fast-paced world that exists today, quick wash-ups have replaced long showers and languished baths. Except for the seasonal dip in the ocean, water therapy has become somewhat of a thing of the past. However, it is as necessary for well-being today as it was years ago. Hydrotherapy has been used in a wide variety of settings such as sports medicine, physical therapy, as well as within the mental health arena. In fact, one of the most common treatments for mental disorders in psychiatric hospitals and institutions was hydrotherapy. A recent nurses’ study has suggested that even though water therapy is no longer part of today’s treatment for psychiatric disorders, it had been shown to be quite beneficial for many when incorporated as part of a treatment plan. Water therapy can come from different sources such as whirlpool baths, showers, dips in the ocean or lakes, splashing in a backyard pool, or just soaking in one’s basic bathroom tub. Whatever an individual’s preference is, the main factor has to do with the relaxation and regeneration that water can give for a variety of conditions. For instance, on those occasions when I feel stressed or need some time away from the multitude of stimuli that prevails throughout the day, I gather soap, towel, candles, and hide away in the warm, bubbly waters of the bath. My children have noted that it seems as if each time I join the land of the living again after one of these excursions, I come out of the bathroom with yet another exclamation of “hey, I have an idea.” Consequently, creativity might also be the end result of a long soak in a spa-like environment as well. Water therapy should not be confused with a cleansing bath or shower, although, that is one of the perks as well. The purpose of hydrotherapy is to let the sensation of the water soothe the psyche as well as the body. The water is the treating agent in this case. Addition of candles in the room as well as aromas such as eucalyptus, lavender, chamomile, and such add to a state of well-being. Water flowing from a shower can add to the negative ionic changes as well and in so doing may help with calming the body and mind as well as recharging it. Just think how the sound of crashing waves, or the calmness of the bay, a babbling brook, fountains in water gardens, and/or water falls allow you to feel and then envision that same type of tranquility and awe when utilizing water as a therapy. Although not totally scientific, the Japanese experimenter, Masaru Emoto suggested the idea that water crystals change as a result of either positive or negative thoughts – therefore, keeping good thoughts in mind is also an nice way to help with healing the mind and body as well. Most everyone is able to benefit from water therapy. Men, women, and children are all great candidates for hydrotherapy. I remember well when my four boys were little and full of energy, one way that helped them regain the stability of calmness was to place them in a tub of warm water and to add just a few bath toys. The addition of classical music in the background (not in the bathroom please), helped them relax and brought their play from that of a frenzy to a more sedate level. At the end of the bath-time, I may have had a lot of water to mop up from the floor as well as myself; however, I also had children who were much calmer. Before venturing into water therapy though, one has to make sure that safety devices are in place such as secure handrails, no electrical units in the bathroom or therapy area, water is neither too cold or too hot, and with children, elderly, or those not quite steady on their feet, another person should be close-by or inside the room as well. Bathing suits can be worn when modesty is a concern. One other neat aspect of using one’s own bathroom, shower, or pool is that there are no costly membership or spa fees. One can make the environment to his or her liking. And who knows-- after a quiet, candle-lit, and aroma laced bath, one might just come up with the idea of the century or even what to have for dinner. Windham fans young and not so young came out on Saturday afternoon to not only enjoy a beautiful fall day, but to cheer on their Windham Lady Eagles as they took on the Scarborough Red Storms in the class A semifinals for girls soccer. The two teams have always ended games in a tie after double overtime situations. Finally, on Saturday, they got to play in a game that would result in only one winner. The Lady Eagles against the Red Storms was bound to be an exciting game and they didn’t disappoint the crowd. Both teams were aggressive and played with their hearts in the first half of the game with neither team scoring. A Scarborough player threw herself over the back of Cassie Symonds while challenging for the ball which resulted in both girls getting hurt. While Cassie was able to come back into the game the Scarborough player was not, resulting in a loss of a key player for the Red Storms. Windham outshot Scarborough on goal throughout the game as both teams continued to carry the ball down field in efforts to end the game for their own team in the regulation 80 minutes of play. As time ran out on the clock, the coaches started prepping for overtime and the possibility of the game coming down to penalty kicks. While Senior Goalie Kate Kneeland held off anything getting passed her in the two 15-minute overtimes, Lizzy Mycock warmed up on the sidelines. It was decided that with Lizzy’s extra length and her proven quick reflexes in penalty kick situations that she would step in and help her teammates send the Red Storms packing. Jenna Soucy, Emily Gilman, Jordan Sargent, Cassie Symonds and Lauren Shoemaker stepped up for the Lady Eagles to shoot the penalty kicks once the 30 minutes in overtime proved once again both teams were matched well in skill, drive and the heart for the win. The win came down to senior Lauren Shoemaker’s penalty kick, if made it would win the game and if missed could allow the Red Storms to tie. Shoemaker took her time positioning the ball and focused on what she needed to do and where she needed to place the ball in the net. The Eagle fans were lined up at the fence and in the stands as a hush fell over the crowd. Everyone watched Shoemakers kick hit its mark and you could feel the excitement all around the stadium. The Lady Eagles were headed to the finals! 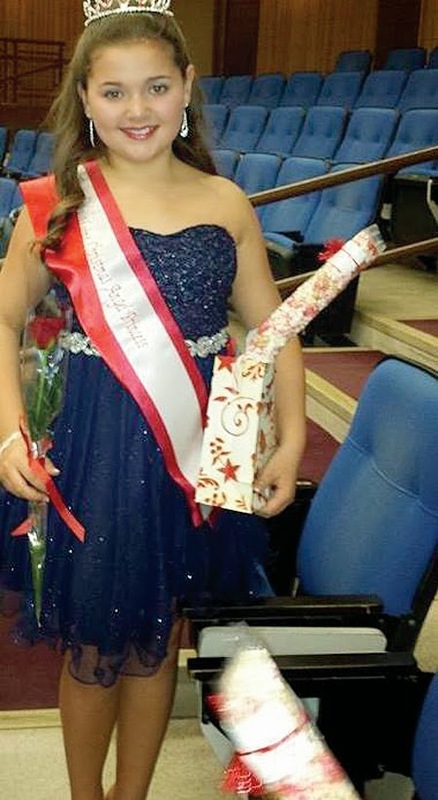 Madelyn Demmons, a Windham fifth-grader won a title for first princess and prettiest eyes in the Maine Christmas Angel pageant in Bangor last weekend. The pageant was based on sponsorship of cash, toys and food to be donated to Toys for Tots, The Good Shepherd Food Bank and the Windham Food Pantry, according to her mom Lisa-Marie Demmons. Madelyn donated 160 food items to the Windham Food Pantry, including 10 turkey dinners. She also raised $137 for The Good Shepherd Food Bank. There were over 40 kids who participated. At seventy-five, George Burk stands over six-feet tall, a gentle giant whose size is only outdone by his kind nature and love for teaching. He is an accomplished painter and sculptor, whose resume includes over 30 solo exhibitions, including ones at Evansville Museum of Arts and Science, Portland Museum of Art, Barridoff Galleries in Portland and the Helen Schlien Galleries in Boston. In 1988, one of his watercolors was selected for “America Draws”, a survey from the permanent collection of the Boston Museum of Fine Arts. His work is represented in over fifty public and corporate collections around the world. After nearly fifty years of teaching art at the University of Southern Maine as an associate professor of painting and drawing Burk is retiring at the end of this semester. “Over that many years, you talk to a lot of people. And when you’re part of a degree program, you have an opportunity to teach students at all levels and that makes it very interesting,” said Burk. Lakes region residents and current USM fine art students Phoebe Crockett, Stacia Dugas and Judith Randall are part of a select group of artists enrolled in Burk’s final semester. 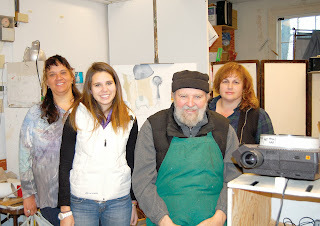 This group is fortunate enough to have experienced his unassuming nature, patience, and calm way of teaching painting. While not every student reaches great heights, several of Burk’s former students have, including Richard Prints and Hiroko Fogarty, both of whom achieved success internationally. Fogarty, a USM student recently wrote and illustrated a children’s book sold in Japan said, “(The book's publication is) because of Professor Burk, he encouraged me." Burk can often be found painting nature out of his mobile studio, his 1987 Ford Ranger pick-up truck, an easel on wheels. The truck has so much paint dripped inside it, that it has become a conversation piece, often eliciting hilarious response from his granddaughters. But for Burk, it serves a higher purpose. He usually parks near an estuary, painting for three to four hours at a stretch. “During that time, major changes have occurred around me, usually those changes are tidal, and tidal change is very important to my work.” said Burk. Burk, an avid art and book collector, plans on leaving behind an extensive collection of art books and slides as a gift to the university. He plans on continuing his active art career and devoting more time painting the pristine landscapes of Maine and will surely be missed by all who know him. Burks work is currently being shown at the George Marshall Store Gallery in York through the end of the year. He will also be shown at the Gorham Art Gallery beginning January 23, 2014.